The Twilight Zone was a dramatic series on CBS television back in the 1960's. There was no regular cast, just a different dramatic story each week. Many motion picture and television stars of the day had starring roles in each episode. 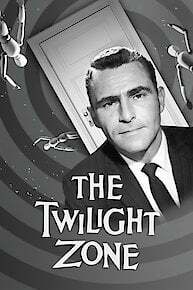 The series was created by Rod Serling. Many of the episodes became famous for the stars, and the plots. For example, Burgess Meredith played a bank teller who loved to take his lunch in the bank vault and read. He was an insatiable reader. Burgess Meredith's character also wore very thick bi-focal glasses. One day, while he is in the vault, there is an attack on the United States. The country is bombed, but Burgess Meredith's character is completely unhurt, because he is protected by the vault. He realizes he is the only person left alive. While he is collecting dozens of books around him, totally elated that he can read all he wants, his glassed fall off his head and break. He is left unable to read. Many episodes had a science fiction type story, while others had supernatural stories as the theme. Agnes Moorhead, Earl Holliman, Elizabeth Montgomery and William Shatner had starring roles in some of more memorable episodes. William Shatners' episode is memorable because of its mixture of science fiction and psychological drama. Shatner portrays a man recently released from a mental hospital, who had a nervous breakdown. While on the way home by plane, he swears he sees a creature trying to destroy the engine while in flight. The Twilight Zone was initially a half hour long. Eventually CBS extended it to an hour, and then filmed it in color. Many years after it was taken off television, there was a motion picture made. But the television series continues to be broadcast in syndication even today. Rod Serling not only created the series, he also wrote many of the scripts. A woman calls in a police report of a giant visitor from outer space. A folk singer becomes obsessed with taping a ballad he heard sung by a backwoods girl. An entire staff is fired by a heartless industrialist and replaced by machines, which soon revolt. A con man convinces a citizen of a Western town that he can raise their dead family members from the cemetery. A samurai sword with a curse of revenge of its murdered master falls into the hands of a Japanese gardener. After a night of partying, a couple awakens to a strange house in unfamiliar town, with no people in sight and a sound of a little girl's voice. A KGB agent plays games with a defector, whose life he's been ordered to take, by giving him three hours to find and defuse a bomb he has hidden in his room. A down-and-out ventriloquist begins taking advice from his dummy on how to steal money, witnessed by a little girl. A man who annoyingly enjoys loud noises suddenly finds pain in the slightest of sounds. A community of bigots want answers when the sun fails to rise over their town on the morning an execution is to take place. A wealthy old man gets revenge on his greedy, spiteful family by making them wear masks during Mardis Gras, emulating their most hideous trait. A man tries to explain to his wife, her death he witnessed after turning on the TV set. The truth is exposed by a magazine columnist over the apparent agelessness of a movie actress. The hanging of a Confederate spy during the Civil War seems to have gone wrong as the rope snaps, plunging him to freedom. A young woman meets up with her future but older self while horseback riding, unaware of the significance until it's too late. The world's most advanced computer seems to have the soul of a woman and has fallen in love with its programmer. A phone call awakens a bedridden spinster during a stormy night, which happens to be from her long-dead fiancé. A motorcycle gang who set up residence in a quiet neighborhood is really a front for an advanced party of an alien invasion. A man schemes to trade age, wisdom and riches with others and become the fellow his girlfriend desires. An astronaut scheduled for a long journey in space breaks the suspended animation device designed to keep him young, so he can age at the same rate as the woman he loves. After committing a hit and run with young cyclist, a motorist's car won't let him forget he is guilty. A gift from her hometown fan club gives a movie star premonitions of her future. An old man is obsessed with keeping a grandfather's clock wound, fearing he will die if the clock runs down. A wealthy old man mocked by his young, money hungry wife begs to receive an experimental youth serum from his brother/doctor. A modern day National Guard unit find themselves in the middle of Custer's Last Stand at the Battle of Little Big Horn. A space traveler from a doomed planet meets up with a female companion on his new homeland. To inherit her insufferable Uncle's estate, a woman learns she must serve his latest invention, which is endowed with his own persona. Survivors of a nuclear holocaust live day by day on the advice from someone they have never seen. An angry man vows to destroy his step-daughter's new doll, which he believes is mocking him. An out-of-work jockey, tired of being the little man, begs to become a giant of a man so everyone would look up to him. A stopwatch with the ability to halt all movement in the world falls into the hands of an insufferable bore. No one can see the gremlin tearing apart an airplane's wing, except a newly released mental patient. A small-time promoter desperately in need of money takes the place of his broken-down robot in a prize fight where humans are barred from participating. Bookie Max Phillips learn that his son Pip, a soldier in Vietnam, has been critically wounded. Distraught over the upbringing of his son, Max offers God his own life for Pip's. A TV writer conjures up the spirit of William Shakespeare to act as his co-writer but end up in a struggle with network heads over what makes "great TV." A couple intent on saving their marriage, go aboard a cruise ship filled with old couples and an ageless secret. A toy manufacturer returns to his old neighborhood where he sees visions of his childhood and those he slighted as kid. A bored businessman makes a deal with the Devil to start his life over in an earlier time period with $1,400 to work with. After a wax museum decides to discard the likenesses of their famous murderers, their custodian retrieves them and stores them in his own basement. A mild-mannered clerk finds Aladdin's lamp but decides that using his one wish for wealth, power or the girl of his dreams would be a waste of the lamp's power. A wily old man, hired by a bankrupt newspaper editor, has the knack of predicting headline stories and claims to be the Devil. A shy bachelor becomes obsessed with a tiny, beautiful doll he sees in a museum exhibit, insisting that she is alive. Jess-Belle enlists the help of a local witch to cast a spell on Billy-Ben Turner to fall in love with her and forget his fiancé Ellwynn. But the spell does have a drawback that strikes at midnight. An astronaut won't believe that he and his crew may already be dead after seeing a duplicate spaceship crash landed on the planet surface. A group of people have developed a way of communicating by the power of telepathy, including a couple raising their daughter in a world void of speech. A young American hatemonger is inspired by the spirit of Adolf Hitler to rise to his own power. A reporter must find a way to escape from what he has learned after he wanders into a peaceful village which holds a mystical secret that can create or destroy matter. A submarine sunk 20 years earlier is apparently emitting sounds which haunt a man who believes he is responsible for its sinking. A scientist tries to correct his imperfections by building a mechanical likeness of himself, which includes of all the finer qualities he is lacking. The voice actress brought life to more than one iconic character. The Twilight Zone is currently available to watch and stream on CBS. You can also buy, rent The Twilight Zone on demand at CBS, Amazon Prime, Netflix, Amazon, Hulu, Vudu, iTunes online.